This spot is supposed to be known for its sushi, but food seems to take a backseat once the cocktails are served. What? 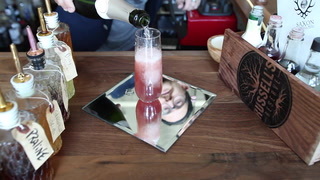 You've never tried a lemony-raspberry Blushing Geisha ($20)? Before you get schnockered tasting all the inventive spirits, start out with the lobster spring rolls (yeah, that orange stuff inside is mango, mixed with cream cheese and peppers, wrapped in wonton paper) and "RA"ckin' crispy shrimp, served with a creamy ginger teriyaki dipping sauce. Then you can move on to some of the more popular rolls, including the Viva Las Vegas (a tempura-battered crab-and-cream-cheese combo with spicy tuna, crab, lotus root, and a drizzle of eel sauce) and "RA"llipop with tuna, salmon, yellowtail, and veggies, skewered and served with garlic ponzu. Or you can always go a little more vanilla with teriyaki, katsu, or noodle dishes. Happy hours rage here from 3 to 7 p.m. Monday through Saturday and on Sundays from 8 p.m. to close. The restaurant is pretty dark, big, and buzzing, but when the weather is decent, sit outside and watch the shoppers go by.